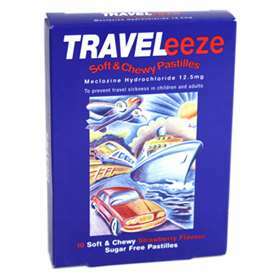 Traveleeze soft and chewy pastilles have been specially formulated with ginger and a strawberry flavour in an easy to take soft and chewy pastille to prevent travel sickness in children and adults. Each pastille contains the active ingredient meclozine hydrochloride 12.5mg. Meclozine is an antihistamine with antiemetic action to prevent the nausea and vomiting of travel sickness. A single dose gives relief for up to 24 hours therefore pastilles may be taken the previous evening or an hour before travelling. They may also be taken if you feel sickness coming on. Product code: TRA659Q Price: £2.49 (incl VAT) Sorry, this product is no longer available.